Calls for relief from the Health Insurance Tax (HIT) continue to grow as small businesses once again get closer to rate filing deadlines in early June. Stop The HIT Coalition members, advocacy groups and business organizations are all urging Congress to prioritize action and suspend the HIT for benefit years 2020 and 2021. This critical relief would help ensure small business owners have the ability to plan ahead for future growth and employee benefits. Absent immediate Congressional action, the 2020 HIT will return on January 1st to begin driving up the cost of care for those who can least afford it. 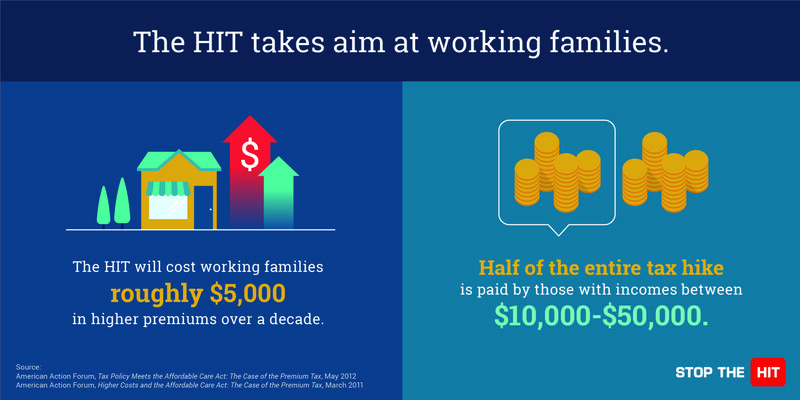 For small businesses, families and Medicare Advantage Seniors, the 2020 HIT will add an estimated $16 billion to their cost of coverage. This increase is simply crippling, worst of all half of the entire tax hike is paid for by those making between $10,000 – $50,000. These individuals need relief, that’s why the Stop The HIT Coalition and our members have been fighting for HIT relief since our formation in May 2011. Together, we’re advocating for America’s nearly 29 million small businesses and their almost 57 million employees as well as 23 million employees covered by their employer. Our members are actively engaged on this issue on Capitol Hill and through grassroots efforts across the country, diligently amplifying the voices of those hardest hit and further calling on Congress to advance legislation to either suspend or repeal the HIT. The National Association of Women Business Owners (NAWBO), sent letters of support to Senators John Barrasso (R-WY), Cory Gardner (R-CO), Jeanne Shaheen (D-NH), Doug Jones (D-AL), Tim Scott (R-SC) and Kyrsten Sinema (D-AZ) applauding their bipartisan efforts to provide HIT relief with the introduction of S. 172 a 2-year suspension bill sponsored by Senator Gardner and S. 80 a full repeal bill sponsored by Senator Barrasso. Center Forward, a non-partisan advocacy group, recently developed an issue brief on the Health Insurance Tax’s impact to consumers which, if not suspended or repealed, will translate to an estimated 2.2 percent premium increase in 2020. It is clear that action is needed now before rate filings happen in early June. Small business owners need the certainty that can only come with relief. Join us in calling on Congress to #StopTheHIT in 2020 and beyond. Contact your Congressional Representative and Senator through Facebook or Twitter and urge them to co-sponsor S. 172, S. 80 and H.R. 1398. If they’re already a co-sponsor, make sure to thank them for standing on the side of small business and fighting to #StopTheHIT.